NSS Labs: Why you need to Test it like a hacker! Some tests you don't want to be too hard. Like those we take in school that we don't think will mean too much to us in life later on. Say, for some it's abstract poetry of the middle ages, basket weaving in the precambrian era, etc. For these you just want to get by, so when an easy test comes along, the tested party generally breathes a sigh of relief. In contrast, some tests are hard for our own good. Physical endurance tests before summiting Mt. Whitney or K2. 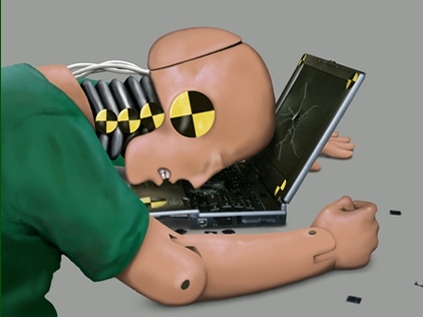 Crash tests of car safety equipment like seat belts, air bags and brakes. You really want to make sure those things work as advertised so they'll function when you need them. So it is with enterprise security testing, and security product testing in particular. In a world where virtually every antivirus (antimalware) or endpoint security product is 'certified' by two or three different labs, one would think they're all equally good. And especially if they've got a certification from the government, right? Dead wrong. They've all been 'certified' because they've been able to figure out how to pass the test, or because the test is not hard enough, not necessarily survive the crash. In our experience, there's rarely such a thing as 'too hard' of a test. In order to know how well a product will defend you, you've got to TEST IT LIKE A HACKER. You need to subject the products in your environment to the same stress and attacks that they will face against motivated, persistent adversaries sometimes even using advanced techniques. After all, fixing problems before a breach is always much less expensive than cleaning up the mess afterwards. As more and more high-profile breaches are disclosed, securing our intellectual property and assets is no longer just a technical issue. NSS Labs makes a lot of its security research and educational content available for free. I encourage you to browse some of the results to find out more.